07:57 - A look back at Salute - In a slight change to the show format, we start with a look back at the recent Salute show. It was Dave's first experience of Salute, and the first time that Neil had attended the show as a 'punter' for a number of years - we chat abour our experience and impressions of the UK's largest wargaming show. 1:07:17 - Confessional - Time to own up to all those hobby purchases we have made recently. 2:15:35 - Outtro - Closing thoughts. 14:11 - Confessional - Time to own up to all those hobby purchases we have made recently. 1:27:59 - Rangers of Shadow Deep - We provide and in-depth look at all the game mechanics in this new co-operative tabletop miniatures game, and (hopefully) answer the question - "Is it any good?" Meeples & Miniatures - Episode 261 - Corps Blimey! 28:18 - Confessional - Time to own up to all those hobby purchases we have made recently. 1:33:23 - 2mm and Army level gaming - Sidney has inspired Mike with his exploits in gaming with 2mm miniatures. We discover what interested Sid in this scale, and chat about the wider subject of gaming at a grand tactical level. 19:25 - Confessional - Time to own up to all those hobby purchases we have made recently. 1:27:52 - Happy One Hundred - since Guy is editor of Wargames, Soldiers & Strategy magazine, which has recently published it's one hundredth issue, we chat to him about the origin of the magazine and his philosophy as an editor. We also talk about the WSS Podcast, the Great Wargames Survey and find out some details about Black Ops, which is a set of rules that Guy wrote and Osprey published. 2:21:00 - Outtro - Closing thoughts. 16:15 - Confessional - Time to own up to all those hobby purchases we have made recently, including what gaming goodies Santa brought us. 1:07:50 - Crusade & Mega Gaming - as Ty is on the organising commitee of the Crusade wargames show, we chat to him about the first show of the year on the UK Gaming circuit. We also chat about Mehagames, as the three of us are due to attend an event in March. 1:59:37 - Outtro - Closing thoughts. 09:38 - Confessional - Time to own up to all those hobby purchases we have made recently. 1:20:13 - Other favourites - more looking back at 2018, including our favourite gaming events, most memorable games, best hobby accessory and Outstanding Company of the Year. 1:56:28 - Outro - What are we looking forward to in 2019? Neil Shuck & Mike Hobbs have the microphone to themselves for this episode of the podcast. 12:12 - Confessional - Time to own up to all those hobby purchases we have made recently. 33:27 - Our Hobby - We talk about our recent gaming and painting, including a weekend painting worshop for Neil. 2:12:30 - Outtro - Closing thoughts. 00:00 - Introduction - We chat with James and discover how he got into the hobby and what his favourite games/miniatures are. 21:20 - Confessional - Time to own up to all those hobby purchases we have made recently. 57:55 - Our Hobby - We talk about our recent gaming, including Keyforge, 1066 Tears for Many Mothers and Kill Team. James tells us about his recent trip to Warhammer world whilst Hobbsy reveals all about his adventures at Grogmeet. 1:34:35 - Tales of a Twisted Pinnacle - James tells us his somewhat cautionary tale of his brief foray into the hobby as a retail seller. On a more positive note, he then shares with us his passion for repurposing toys as wargaming models. 2:38:42 - Outtro - Closing thoughts. Neil Shuck & Mike Hobbs are joined by guest presenter Dave Hickman for this episode of the podcast. 00:00 - Introduction - We start the show by chatting with Dave and discover how he got into the hobby. 18:07 - Confessional - Time to own up to all those hobby purchases we have made recently. 1:29:32 - Tales of Gaming - We chat to Dave about his gaming hobby, and also give an overview of the new Mortal Gods skirmish game, coming from War Banner in 2019. 2:22:32 - Outtro - Closing thoughts, plus the latest edition of 'Rise of the Anti-Luff'. Neil Shuck & Mike Hobbs are joined by guest presenter Josh Langley-Shuck for this episode of the podcast. 00:00 - Introduction - We start the show by catching up with what Josh is currently up to. 07:45 - Confessional - Time to own up to all those hobby purchases we have made recently. 1:11:19 - Review - We take an in-depth look at The Lord of the Rings: The Card Game and its recent digital version. 2:29:40 - Outtro - Closing thoughts, plus the latest edition of 'Rise of the Anti-Luff'. 00:00 - Introduction - We start the show by catching up with Terras, and find out what the latest offerings from Geek Nation Tours. 17:05 - Confessional - Time to own up to all those hobby purchases, plus we consider if the waiting time for Kickstarters impacts our eventual enjoyment of the games/models we ordered. 58:40 - Our Hobby / The Meeples Challenge - Teras talks about Kill Team and Frostgrave, Neil discusses Imperial Assault: Legends of the Alliance and Escape from Colditz whilst Mike gives an update on his LOTR painting. We also catch up on the latest progress on the Challenge. 2:43:10 - Outtro - Closing thoughts, plus the latest edition of 'Rise of the Anti-Luff'. 00:00 - Introduction - As we start the show we share our thoughts on the recent release of the Command & Colors: Ancients video game and discuss the announcement from Devil Pig Games about their financial difficulties. 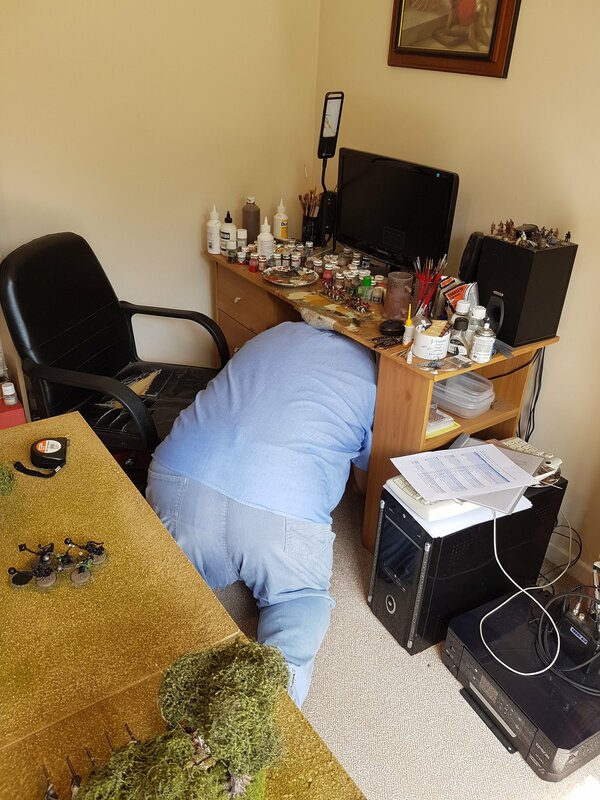 54:47 - Our Hobby - Mike talks about painting 2mm miniatures, Dave loses his flesh painting mojo and Neil shares his thoughts on Saga 2,0 and Taiyo Dynasties. 1:24:02 - The Meeples Challenge - Neil talks about his campaign background, whilst Mike decides on his rules - Et Sans Resultat! 2:59:27 - Outtro - Closing thoughts, plus the latest edition of 'Rise of the Anti-Luff'. Meeples & Miniatures - Episode 250 - Q&A Extravaganza! In this episode the Meeples crew - Neil, Mike & Mike - get together to celebrate the 250th episode of the Meeples & Miniatures podcast! In honour of the occasion, we answer a huge number of questions from listeners that have been given to us via the blog, Facebook and e-mail. If you enjoyed this episode of the Meeples & Miniatures Podcast, you may want to become a supporter of the show. Details can be found on our Patreon page. As we said on the show, the podcast is now taking a break for the next couple of months (our first holiday in 4 years!) so there will be no new episodes of Meeples & Miniatures published until September. However, there will be new blog posts, plus several Patreon-exclusive audios, published over the summer. In this episode Neil Shuck and Mike Hobbs are joined by Dave Luff (yes, he's back!) and Josh Langley-Shuck to chat about their recent visit to the UK Games Expo 2018. Finally, we have a brief chat about the recent announcement from Fantasy Flight Games about the second edition of the X-Wing Miniatures Game. Later in the show, they are joined by Michael Lovejoy from Oathsworn Miniatures. We catch up with what Oathsworn have been up to for the last year, and chat about the brand new hardback version of the Burrows & Badgers skirmish rules. For this bonus episode of Meeples & Miniatures, Neil & Mike are joined by Annie Norman from Bad Squiddo Games. We catch up with what she has been up to in 2017, and get a preview of the Freya's Wrath Kickstarter, which is launching in January. For the feature part of our show we chat with Andy Hoibday, owner of Footsore Miniatures, about their forthcoming game Gangs of Rome. And, whilst he was on the show, Neil also quizzed him about future plans for Test of Honour. For the feature part of our show we chat with Simon Miller, author of Too The Strongest. We catch up with everything that has been happening with those Ancients rules and also discuss his new sety of English Civil War rules which are due for release next year - For King And Parliament. The Meeples crew get together once again to talk about what they have been up to. As well as chatting about their gaming, they also discuss the recent Derby Worlds show, the Battle of Britain Kickstarter from PSC Games and The Welsh Wizzard finally reveals all about 'the game that cannot be mentioned'. For the feature part of our show we do something a little different as we chat with James Morris from the Lenton Gamers about the inspiration behind their award winning 'Oppy Wood' demonstration/participation game. The Meeples crew get together once again to talk about what they have been up to, which this time includes Test of Honour, Dire Wolf Rampant, 7th Continent and Arkham Horror: The Card Game. Due to the length of this week's feature interview, this weeks show has minimal chat about what we've been getting up to. Instead, we launch into our feature, which is an interview with game designer Jake Thornton. The main aim of the chat is to find out the latest on Mythic Battles: Pantheon and also find out as much as possible about the forthcoming game: Time of Legends: Joan of Arc, which is launching on Kickstarter on the 10th October. Events of the last 24 hours have forced us to change the contents of this show at the last minute. The Meeples & Miniatures crew get together once again to talk about what they have been up to, which this week includes the boardgames 7th Continent and The Godfather: Corleone's Empire plus The Other Partizan wargaming show. 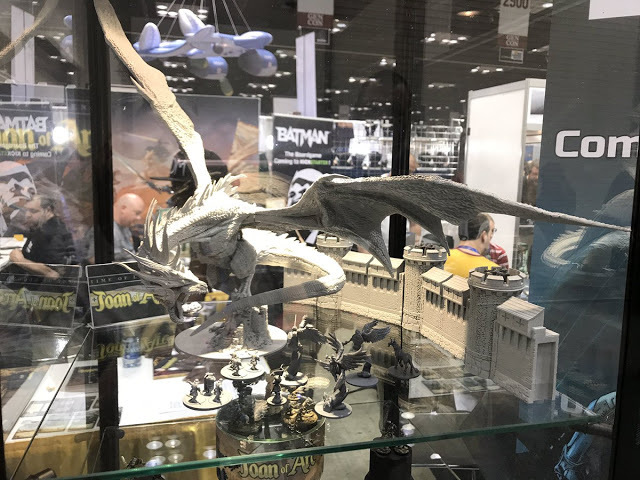 We also chat about some of the recent news announcements from GenCon 50, including Time of Legends: Joan of Arc and Star Wars: Legion. The Meeples & Miniatures crew get together once again to talk about what they have been up to, which this week includes the boardgames Amyitis, Samurai, Nine Worlds and The Godfather: Corleone's Empire plus a visit to Firestorm Games, Cardiff. For the main part of our show, we are joined by Rich Jones for an in-depth review of Test of Honour - the Samurai skirmish game from Warlord Games. In this show we are joined by Neal Reid to chat about several card games he has designed, which are published by Vexillia. These include The Somme card game series, This Hard and Calcined Earth and the forthcoming Revolution. In this show hosts Neil Shuck, Mike Whitaker & Dave Luff catch up with what they've been up to in the hobby this week (surprisingly little actually!). For the main part of our show, we are joined by Mike Hobbs to review the Conan Boardgame. In this bonus podcast episode hosts Neil Shuck, Mike Hobbs, Mike Whitaker & Dave Luff discuss the recent Salute 2017 show. We also catch up with what we've all been doing in the last week, which includes an interview that Mike Whitaker recorded when he visited the Snakes & Lattes boardgame cafe in Toronto, Canada. In this show hosts Neil Shuck & Dave Luff travel to Salute 2017 and bring you a number of interviews from the day. Mike Hobbs takes the reins of the podcast to present a show about one of his all-time favourite games - Space Marine/Epic from Games Workshop. In this show we are joined by Rob Alderman from Hysterical Games. We talk about Rob's gaming background and work history in the wargaming industry, and then chat about how he came to be involved with Hysterical Games and Panzerfauste. We also discuss the other side of Hysterical Games' business - contract casting. In this show we are joined by Keith Armstrong from Armies Army. We discover how Keith got started in the hobby, how the company has grown, and how its main range of miniatures, rules and scenarios - 15mm Modern Cold War - came into being. In this show, the Meeples & Miniatures team catch up with what they have been doing in the hobby over the past week. For our main feature, we are joined by Teras Cassidy from Geek Nation Tours. We catch up with what the company has been doing since we last spoke, and also chat about the Freebooters Podcast network. In this show, hosts Neil Shuck, Mike Hobbs, Mike Whitaker and Dave Luff catch up with what they have been doing in the hobby over the past week. In this show, hosts Neil Shuck, Mike Whitaker and Dave Luff catch up with what they have been doing in the hobby over the past week. For our main feature, we are joined by Mike Hobbs and chat about the dungeon-bash boardgame/miniatures game from Mantic Games: Dungeon Saga. In this show, hosts Neil Shuck, Mike Hobbs, Mike Whitaker and Dave Luff talk to Craig Thompson of Tiny Terrain Models. In this special show, hosts Neil Shuck Mike Hobbs, Mike Whitaker and Dave Luff celebrate the 10th Anniversary of the podcast. This show is a recording of the live stream that we did, which included a large Q&A with listener questions. In this episode Neil Shuck, Mike Hobbs & Mike Whitaker are joined by the host of The Veteran Wargamer Podcast: Jay Arnold. We've recorded a joint show. In this show, we interview Jay about his podcast, discuss a couple of topical issues, and then we review the Commands & Colors series of boardgames. If you want to listen to Jay interview us, then you will have to listen to the Veteran Wargamer Podcast, Epsiode 8. In this episode Neil Shuck, Mike Whitaker & Dave Luff take a look back at 2016. We reveal our top 5 games of the year, our best purchase of 2016 and also our worst game of the year. This episode is hosted by Neil Shuck, Mike Whitaker & Dave Luff, and sees the welcome return of Mike Hobbs. We all get together in the Meeples Bunker just in time for Christmas to bring you a mix of hobby chat, news, views and a delve into the mailbag. In this show, hosts Neil Shuck and Mike Whitaker talk to best-selling historical fiction author Dr Harry Sidebottom. We chat to Harry about his background as an ancient historian, how he got into writing historical fiction, and his tabletop gaming hobby. In this show, hosts Neil Shuck, Mike Whitaker and Dave Luff talk once again to Too Fat Lardies supremo: Richard Clarke. In this show, host Neil Shuck chats to Neil Fawcett, owner of Spartan Games, all about their recent new Kickstarter project: Dystopian World Expansion, which is running until the 21st December 2016. Continuing our smaller shows, this episode sees hosts Neil Shuck, Mike Whitaker & Dave Luff together in the Meeples Bunker. This is basically all the 'host chatty bits' gathered into a show of its own: Banter from the Bunker. In this show, hosts Neil Shuck, Mike Hobbs, Mike Whitaker and Dave Luff talk to Dave Brown about his new Amercan Civil War rules - Pickett's Charge. In a change to our original show, hosts Neil Shuck, Mike Hobbs, Mike Whitaker and Dave Luff talk to "The Voice of Olympus" - Jake Thornton. This interview was originally meant to be a news item in a longer show, but it went on for a bit longer than intended...by about 100 minutes or more...so we turned it into its own show! Jake tells us all about Mythic Battles: Pantheon - the forthcoming game from Mythic Games and Monolith. In this show, hosts Neil Shuck, Mike Hobbs, Mike Whitaker and Dave Luff take a trip to darkest Evehsam, to the home of Gripping Beast. There they encounter Andy Sherwell and Martin Gibbins. They chat about the history of Gripping Beast before a more in-depth conversation about their new mass battle set of Ancients rules: Swordpoint. In this episode, hosts Neil Shuck Mike Hobbs & Mike Whitaker are joined by author Keith Flint to talk about his rules Honours of War, from Osprey Publishing. We also review Cigar Box Battle Mats. In this episode hosts Neil Shuck, Mike Hobbs, Mike Whitaker & Dave Luff talk about what they have been up to in the hobby, chat about some of the latest hobby news and delve into the mailbag. In this episode, hosts Neil Shuck, Mike Hobbs & Mike Whitaker once again chat about all things wargaming. Due to time considerations, this episode only contains our main features, which are once again two interviews - once we'd recorded the interviews, we didn't have room for anything else! Then we are once again joined by Richard Clarke of Too Fat Lardies. We catch up with the latest happenings on Lard Island, and have a (very) in-depth discussion on the Sharp Practice 2 rules. which are due out next month. In this episode, hosts Neil Shuck, Mike Hobbs & Mike Whitaker discuss what they've been doing (Hobby-wise) for the past two weeks and once again cast their eye over some of the latest hobby news.